The Model 80E Voltage Dividers extend the Voltage measuring range of Fluke differential voltmeters. The Model 80E-10 has a maximum input voltage of 10KV. Both 10V and 1V output terminals are provided, which permit use of the 8OE with Fluke differential voltmeters, or a null type potentiometer. 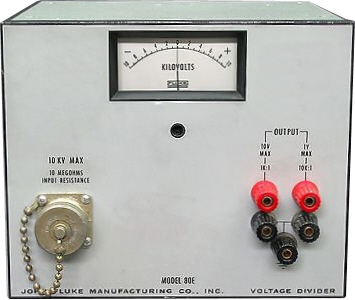 A center zero panel meter permits observation of the approximate magnitude and polarity of the unknown voltage. In order to ensure maximum accuracy and long life, properly aged, wirewound resistors, having a very low temperature coefficient, are used throughout the instrument. The case of the instrument is suitable for either bench use or rack mounting.